Improve Your Health with these Power-Packed Foods! They say you are what you eat ... and that is sort of true. When you eat crappy food, your health declines, and your energy ebbs. You even become more prone to illness. However, when you eat healthful foods, you gain energy and vitality and your immune system becomes stronger. Downloadable cookbooks, holiday guides and more. A variety of recipes you can try out for yourself. Are you ready to get creative in your kitchen? The Mission of Carma's Cookery is to help you unleash your kitchen creativity. Whether you are looking for new recipes, gift ideas or just some culinary inspiration, you will find it here. You will also find information on how to make your meals more healthful, while still being tasty. Carma's Cookery is all about kitchen creativity, the soul of gift-giving and entertaining with heart and imagination. Creating in the kitchen can be a fun, wonderful experience. Here you will find ideas for using cooking and gift-giving as creative outlets. 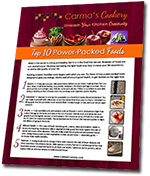 Whether you're making a meal for the family or guests or creating a personalized, home-made gift from the heart, you'll find ideas, resources and more at Carma's Cookery. To provide you with the best resources for becoming more confident and creative in the kitchen, I share cookbook and product reviews, taste tests, recipes, interviews, ingredient highlights, and more.